This troparion is sung at the beginning of Matins on Holy Monday, Tuesday and Wednesday, giving these services the name of “Bridegroom Matins.” They have become the main service in the Greek and Melkite traditions. Here Holy Week preserves the most ancient traditions of the Divine Praises. In antiquity, the Matins was a middle of the night service, and therefore this troparion expressed the Christian need for constant watchfulness for the presence of God. 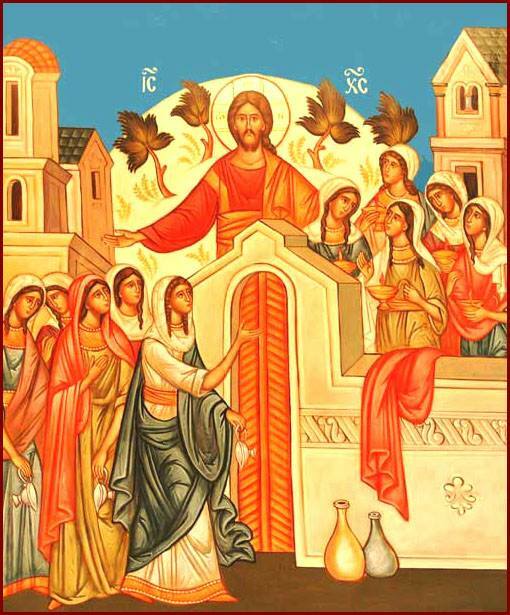 In Holy Week the parable of the wise and neglectful virgins in read in the Gospel for the Presanctified Divine Liturgy. We must be aware that the Lord is coming. In every Divine Liturgy of St. John Chrysostom, when the presider begs the Father to send the Holy Spirit, he prays that the Spirit may be for a spirit of vigilance. St. Paul warns us: For all of you are children of the light and children of the day. We are not of the night or of darkness. Therefore, let us not sleep as the rest do, but let us stay alert and sober” (1 Thessalonians 5:5-6). This is especially important in Holy Week, where the disciples fail in watchfulness in Gethsemane: “When he returned to his disciples he found them asleep. He said to Peter, “So you could not keep watch with me for one hour? Watch and pray that you may not undergo the test” (Matthew 26:40-41). Holy Week tests our spiritual awareness. Indeed, the Matins Gospel has Jesus’ condemnation of the scribes and pharisees. “They tie up heavy burdens hard to carry and lay them on people’s shoulders, but they will not lift a finger to move them …. “Woe to you, scribes and Pharisees, you hypocrites. You lock the kingdom of heaven before human beings. You do not enter yourselves, nor do you allow entrance to those trying to enter” (Matthew 23:4.13). This is so often the clerical sin, to neglect the welfare of people for the sake of a prideful ideology. The Holy Week is a direct challenge to our spirituality— how have we failed to proclaim the gospel. Have we learned the lesson of love? The story of the Last Judgment, read at the evening gospel, tells us what we must do for one another, and especially to see the image of Christ in the other. In the long run, this is where “keeping our eyes fixed on Jesus” leads us.